What Are The Health Benefits Of Deep Breathing? Deep breathing is a safe and effective relaxation technique that also offers several physical and mental health benefits. The Harvard Medical School terms deep breathing as one of the ‘body’s strongest self-healing mechanisms’. Deep breathing is a conscious process that involves a deep inhalation followed by a deep exhalation in a slow and controlled manner. Since this process involves the abdomen and the diaphragm (the muscle that separates the chest and stomach cavity), deep breathing is also abdominal breathing and diaphragmatic breathing. 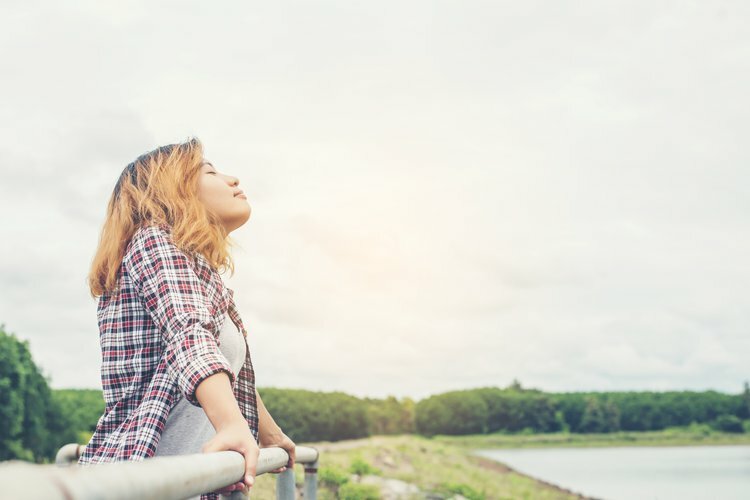 Individuals who spend time daily (10-20 minutes) on deep breathing in a relaxed and quiet environment find that they feel good and are generally able to handle stresses much better. Deep breathing is a safe and effective relaxation technique that also offers several physical and mental health benefits. Since with each breath more oxygen is drawn in and more carbon dioxide exhaled, it leads to increased oxygen to various body parts (especially the heart and brain) and efficient removal of body toxins. In addition, the heart rate slows down and blood pressure levels stabilize. Short-term and long-term health benefits are due to changes in the body physiology that include lowered blood pressure, reduced heart rate, decreased release of stress hormones, stress relief, better balance between the gases in blood, enhanced physical and mental energy, and better immunity. The most proven forms of relaxation techniques, like yoga and Tai Chi, advocate the use of controlled, deep breathing to manage stress, anxiety, and panic, and to encourage and promote relaxation. It has been researched that shallow breathing can disrupt the balance between oxygen and carbon dioxide gases in the body, which can worsen stress symptoms and lengthen anxiety duration. In such cases, controlled breathing techniques are recommended to relieve stress. The National Center for Complementary and Alternative Medicine (NCCAM) says that menopause-linked hot flashes may be relieved using exercises involving slow and controlled breathing exercises. A study by Martarelli et al (2011) on athletes with normal blood glucose levels shows that deep breathing can reduce oxidative stress that occurs after a meal. The research says that probably due to the activation of the sympathetic nerves in the body, there is reduced production of free radicals in the body (higher antioxidants levels were seen), glucose levels in blood are decreased, and an increase in insulin levels is observed when one takes a deep breath. The US Department of Veterans Affairs attests to the fact that civilians and army veterans, who have undergone traumatic events and stressful situations (such as being in a war or war zone, or civilian assault) may be able to cope better with posttraumatic stress. They inform that the symptoms of stress, including depression and panic attacks, respond very well to passive relaxation methods like deep breathing. Martarelli, D., Cocchioni, M., Scuri, S., & Pompei, P. (2011). Diaphragmatic breathing reduces postprandial oxidative stress. The Journal of Alternative and Complementary Medicine, 17(7), 623-628. Westerdahl, E., Lindmark, B., Eriksson, T., Friberg, O., Hedenstierna, G., & Tenling, A. (2005). Deep-breathing exercises reduce atelectasis and improve pulmonary function after coronary artery bypass surgery. CHEST Journal,128(5), 3482-3488. Paul, G., Elam, B., & Verhulst, S. J. (2007). A longitudinal study of students' perceptions of using deep breathing meditation to reduce testing stresses.Teaching and learning in medicine, 19(3), 287-292.